When you first set up an account in Shorthand, you are assigned a demonstration workspace. It's a testing space you can use to familiarise yourself with the basics of the Shorthand editor and invite colleagues to test it out with you. In order to publish stories you will need to set up a subscription plan to upgrade your workspace. Some Shorthand plans also unlock the ability to assemble workspace members into teams and offer unique story features. You can view all of our plans here. The owner of the workspace can add colleagues to Shorthand by clicking 'Manage Members' using the dropdown in the top right hand side of the dashboard. On the resulting 'Workspace settings' page, a short form allows you to invite individual or multiple people via email and assign them a team. This will send each member an invitation asking them to create an account. Once they have accepted the invitation and created their account, the owners and team leaders will receive a notification letting them know that the new users have joined. The team owner and other team members can also choose to add members to other teams (if available in your subscription) and will be able to collaborate with them on stories. Find out more about collaboration here. Any workspace member also has the ability to add other members or invite new users to their team. This can be achieved simply from any view of the dashboard. In the top right of the page is a row of icons representing the current team members along with a green + icon to add a new member. 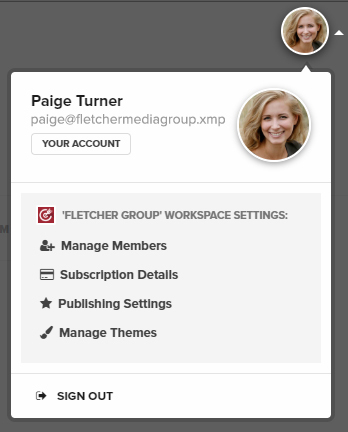 Clicking the green icon will pop open a small window from which existing workspace members may be added to this team, or email addresses may be entered to send invitations to new members. If you want to delete a user from your workspace because they no longer need access (or are leaving the company or group), please let us know. We can also help re-assign their stories to the correct person, if they did not do this before they left. Each team is maintained by a team leader/s (set by the workspace owner). The team leader/s can revoke team access of other members, assign publishing permission to individual members, and set publishing and theme options for the team. 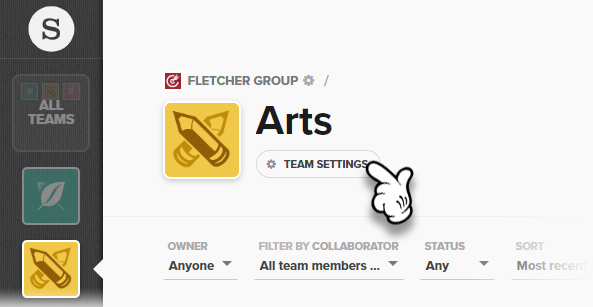 Workspace owners and administrators can manage teams within a workspace by clicking the Team settings button under the name of any team on their dashboard. manage publishing permissions for individual members (who can and can't publish to which destinations). Some Shorthand plans allow for multiple teams, and they are a great way to split groups of users, types of content, themes and publishing locations, which can all be set to differ by team. If your subscription allows for multiple teams, you can easily add more with a button on the left-side of the dashboard under your existing team(s). If you have access to multiple teams, it is important to remember to start your new story in the right team as they can't be moved between teams. From the dashboard, if you create a new story from within a single-team view (or if you only have access to one team), then your story will be in the right place. If you start from the "All teams" view of the dashboard, then you'll be presented with a screen from which to choose the story's team.